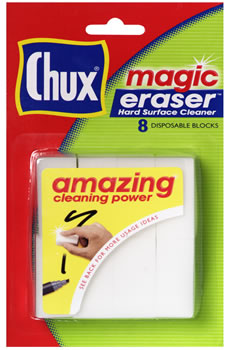 So Chux, sponsor of awesome, currently have a brilliant competition called The Great Cleaning Debate. I'm hesitant to share it with you because, in my mind, I've already spent the $5,000 first prize. It went on a Nanny, some good quality vodka, and a bottle of Veuve Cliquot. I am determined the good stuff will one day pass these lips, even if it's by covertly sampling someone else's while they're not looking. Or osmosis. Unfortunately for me, I'm not allowed to enter, and so I'll continue to throw back Passion Pop and cask wine while dreaming about the Nanny that could've been. I have consoled myself by watching #1Hubby work up a sweat. Kind of like the Cleaner that could've been, if only I'd planned and budgeted better and had even an iota of a clue of exactly how much mess and destruction three kids could inflict every. single. day. Since I can't enter, let me still inflict up share with you my own personal Great Cleaning Debate...and anyone who thinks it worthy of $5,000 is welcome to cough up. I consider myself to be the smartest, most cunning and calculating in the family. And if you knew my family, that is indeed no mean feat, and something I'm quite proud of. In the early years, it was easy to convince #1Hubby to do stuff. Back in ye olde days when he was still trying to impress me. Flash forward 16 years and it now requires some covert tactics and the gentle art of passive persuasion. Example: I hate ironing. With a passion. I'd rather watch a 24hr Justin Bieber marathon than iron a week's washing. Maybe. Issue: While I get around the house in an extensive collection of black and white Tshirts that don't really need ironing, #1Hubby goes to work in businessy attire that must be ironed. Solution: Crank the iron to maximum temperature and set that sucker down on a white shirt and watch it sizzle just one time and you're not allowed to iron ever again. Example: I hate vacuuming. Even more than ironing. To avoid this, not only would I watch a 24hr Justin Bieber marathon, but I'd do it at a live concert where Billy Ray Cyrus and Miley were doing a father daughter duet as his opening act....wait for it....with encore. Issue: We have 3 kids and a cat. And a sandpit that is intent on moving indoors, one grain at a time. If we don't vacuum at least every few days, we may as well don bathers and pretend we live at the beach, on account of the layer of sand that builds up every day. Solution: Accidentally whack his beloved TV a couple times with the end of the vacuum as you studiously vacuum in front of the TV in the dying minutes of a Carlton Football Club match, and #1Hubby's beside himself with fear of losing his most treasured possession at the hands of my severely unco-ordinated self. With the added benefit of the vacuum noise drowning out his frustrated "requests" for you to move or wait just five minutes for the game to end. So effective I didn't even realise we'd bought a new vacuum until I saw it in the shed and asked whose it was. So you see, I'm quite the expert at passive coercion. No begging, pleading, nagging, bargaining. Except, I think I've been outdone. And it's been happening for all of our 16 years, and I've only recently found out about it. Example: He hates washing. So much that he'd probably rather sit and listen to me drunk and gushing about my epic night out while he'd stayed home with the toilet training twins, sober. Issue: I don't mind it, but I don't want to do all of it myself. Heaven forbid! Solution: In the very early days of our relationship he would go out of his way to find a dark coloured garment that would be guaranteed to run in a hot wash. He'd stick it in with the white's, claiming he hadn't seen it or didn't realise it would run. For good measure, he'd often include a few tissues, for the "snowy / dandruff" effect. As a result, we spent a few weeks getting around in a uniform of browny/blacky/tye died/tissue bit covered clothing. Until I stepped in and took over all laundry duties. Forever. And I only found out when I overheard him providing this piece of marital advice to a young relative about to tie the knot. I freaking love that man. Sometimes, he surprises me and is even more calculating than I. Keeps the spark in the relationship, no? 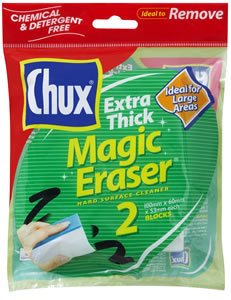 Get thee over to the Chux Facebook page and enter the competition with your own Great Cleaning Debate. 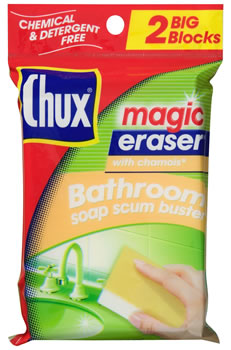 Not only are Chux a sponsor of awesome, they are an uber generous sponsor of awesome. Go ahead and pretend you're not jealous. It is the mother load of cleaning products. It is also a whopping great saving on our grocery bill, which I have already allocated to shoes and wine for DPCon12. Which kind of means I should thank Chux twice for their sponsorship, since all of this has enabled me to extend it to a new pair of shoes. Much obliged Chux! Don't even get me started on how psyched #1Hubby was when he opened the enormous package. Because as soon as he saw who it was from, he literally hip and shouldered me out of the way like a footy player diving for the ball. I feigned protest, and tried to pace myself before casually suggesting he try some of it out. He said : Perfect for the soap scum that coats shower screens, and hairspray misfire all over the mirrors (seriously, how hard is it to aim at your head when you spray?). I said : Sadly, not suitable for wrinkles or under eye baggage. He said : Texta begone! I also used it on my faux leather laptop bag and the softer blue side got rid of the crayon perfectly. I said : Not suitable for faux leather shoes with red wine stains. Oh well. Refer to earlier reference to new shoes requirement. He said : Yep, works well. (He was a little bit pissed that I wasn't using his original comment). He said : Yeah, they're good. They work. What do you want from me? The cricket's on! (At this point I had maxed out both his stamina and his manly attention span. And realised he was missing the cricket while I sat and watched him clean). I said : There is nothing more appealing than watching a man clean. Period. Kudos Chux. And now for the giveaway! I have a full Chux pack to give away. We're talking months of cleaning products. Or at least a year's worth, if you're as non-commital on the cleaning front as I am. My best tip for covertly encouraging others is to do an average job. everytime i vacuum my husband says to me "Do you have your eyes in??" (i wear contacts) I always comment by saying yes, I've done a great job... he then mumbles and says just leave the vacuuming to me! My tip for the bathroom is tell hubby the chemical upset your senstive skin! My hubby always takes over cos he would hate to see me all red and itchy!!! FB follower of both pages as Chon Ky. I bribe the 4 year old with lollies & I let the 7 year old clean out window sills & door rails with water & soap on tiles. He's allowed to make as much spills as he likes as long as he mops it up with a towel afterwards. While cleaning the house I get my kids to follow me around and help me with the easier tasks such as making their beds, dusting and collecting their toys. They now see that as a routine and help me all the time. The earlier the kids start participating in household duties the better, now they find these chores fun and enjoyable. And at the end of the day they get to go to the park or an outing. I turn the music up and dance and sing while cleaning. 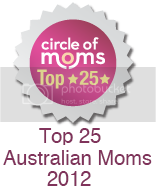 It motivates my husband and child to join in and we have so much fun doing it. I find the best way to convert or encourage the kids and hubby to help out is BRIBERY. When it works I get what I want and everyone is happy. I detest doing dishes and cleaning the kitchen, so I've trained my partner to do it with positive reinforcement. I do love cooking and he loves eating, so whenever I come home to a clean kitchen he gets delicious food! Cleaning, what is cleaning? The four year old has everything out again as soon as it is away. Tweeted and Shared on Facebook too. While cleaning, I always nonchalantly ask someone to please tidy up a certain area. I don't make it a bid deal and funnily enough they do it without fussing. I encourage cleaning by doing it together in a fun way. For my 5 year old, I say lets sit down in your room and see what needs to be put back in its home. We put them to bed together, eg putting the books on the shelf nice and tight together so they all stay warm for the night. We then wipe the shelves, as it is their blankets, so they dont have dirty sheets and dust to sleep in at night. Everyone needs sleep and bed in their home, and if they dont have a good nights sleep in there home(which is the toy box, or the book shelf) then they will be too tired to come out and play the next day. And my husban is on a diet as such, so I tell him to vacuum and mop at least twice a week for exercise. He is exercising without even knowing it. It works to get him up and moving, as he has lost 4 kilos in three weeks. Whenever I spill any food on the floor, I go wake my cat up, she's happy to lick up milk puddles, crumbs of cheese, or dollops of yoghurt that didn't quite make the bowl. It also works to clean plates (no, not like that) to hurry up kids dawdling over dinner. "Hurry up or the cat will eat it" usually gets them to finish their dinner off quick smart. Sigh VERY loudly whilst doing a household chore - this usually guilts my guy into helping me out!! Tell the kids that you are going to play a new game. The one to do the best cleaning is the winner. Cleaning is not on the top of my 'favourite activities' list either. I try and clean up as I go so it doesn't bank up too badly. A couple of minutes putting away or wiping up is a whole lot easier to swallow than hours at it with no end in sight. When I was little, my brother and sister invented a game to see who could dry the most dishes. I always won! Since I worked out the "rules" I have taught it to my children. They love it. pump up the music, cleaning becomes fun! oh, and i like "love" you on fb and follow your blog. Send everyone out of the house.....have a berocca and go go go!! In the middle of the shower recess put the shower cleaner and scrubber, or the pack of scum- removing cleaners . Either they shower with them or use them , then remove them. They wouldn't dare remove without a cleaning effort first- the wrath of an angry housewife isn't work it! I am honest enough to admit, I am a control freak, so I like to do all the cleaning myself. That way I know its done properly, I am a cleaning freak when it comes to my three toilets, two bathrooms, four bedrooms, super long hallway, even the light switches can't get past me. 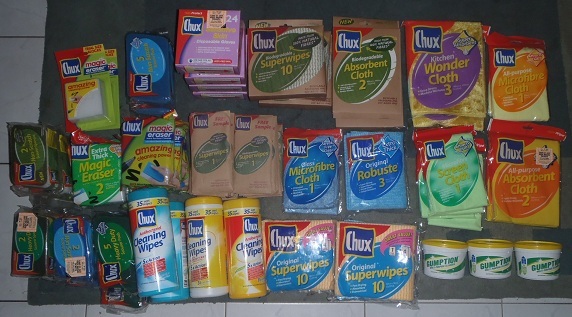 I will be in chux heaven with those wonderful products. Each afternoon we have clean up time. I encourage my kid's by letting them choose which jobs they want to do out of a selection of chores I need done. Surprisingly when they get to choose there happier to do it and there always proud of there efforts. Have tweeted, shared & follow both you & Chux. Bribery usually works best for me, knowing that there is a reward for their efforts at the end of the task gets my family VERY motivated. I often use an outing or something pleasurable in leisure as my bargaining tool. Oh I love how you get your hubby to take over the house work and the cleaning! I usually start a job, and let hubby know that I want it done like yesterday! He gets reallly upset (because he is the perfectionist in our family -serioulsly!) and starts to show me "This is how it should be done" - so I step aside (play the dump blonde - even though I have black hair!). Then before I realise it (or he realises it) he his halfway through the job! I watch while he finishes the job, and he gloats about how good it looks! I am happy because the job is done. Twitted the competition and shared on facebook! bribery works for Miss 4. With MIss 8 & Miss 10, they have no choice. If they dont do it when asked, they are still going to have to do it anyway. Hubby is the OCD cleaner in our house - he's even trained me to pair socks on the washing line (soooo wrong). BUT the other day I got sick of the freezer door not closing properly and ruining all our meat (not to mention making my vodka room temperature!). Hubby half arsedly chipped away at the frost near the door and said 'all good' (NOT all good!). So I put babies off to sleep and pulled the ridiculous amounts of icecream containers out of freezer (all had only Vanilla in them) and got some manly tools and set to work. Within a few *very large* sighs on my part I had dear hubby watching (and criticising) along with teenage stepson saying 'no do it like this'. I relinquished said manly tools and they had it done in a jiffy! woohooo. I just make a game or competition of it for the kids. Im a cleanaholic and my children hate it, but I dont want my boys to be a burden on their wives or girlfriends so I make them clean especially on a Saturday before everyone goes out and does their thing, they cant leave the house until its tidied, vacuumed and polished. They do a good job too because I just make them go back and do it again if its not. I turned a Chux microfibre cloth into a "cleaning" puppet and get the children to "use" him on their furniture! I don't really like cleaning but I do like my house clean! 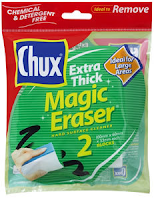 I give my children a Chux Wipe each and we do the Hokey Pokey to "you put your right hand in and you dust it all around"...works a treat! Mister kept putting off cleaning out the shed, so I got in there. I *threw* everything out either on to the grass or straight in the bin. Mister could not get out there fast enough. I am now forbidden to do the shed. Fine by me. Have a baby, and even if you're high on caffeine fake "extreme tiredness" whenever family & friends drop around. Cleaning - DONE! Not so coverty, but every other week, the neighbours and I visit each others houses for a blitz clean. ( 4 of us)..We each took control of a room ie bathroom / kitchen and cleaned the room top to bottom. Within a couple of hours one of us had a perfectly clean house..the following week we tackle the next house on the list. My kids love cleaning the fridge. Taking all of the food out of the fridge, checking expiry dates, wiping shelves down, then putting everything back the way they think works best. It's my win-win kitchen solution! single mum six kids work 5 days!!!! Kids always argue about bed time . Set base bedtime and let them earn extra minutes for jobs. More minutes for harder jobs. Tea gets cooked somedays, dishwaher emptied, washing on or out. Works well with younger ones and the older ones dont want their little brothers and sister going to bed later than them. A great way to andball those tiresome day to day jobs and has also taken the bedtime arguments off my hand and into their own.I made the list of jobs i wanted done and left it to them. All smiles for me!!!! my daughter had the best scam from a small child to get out of doing the dishes, her logic was that as she only has 1 hand she 'can't ' wash dishes as she can't hold them properly and will smash them , she knew that would work everytime , she still tries to pull that one now and she is almost 21. Followed, Liked, shared and tweeted. I try to make cleaning fun. We turn it into a competition to see who can get the most toys put away within say 10 minutes, done to music of course. I play a "game" with master three. He hands me the wet washing from the basket and tells me who each item belongs to. It gets quite tedious as more and more items in the basket make it to the line. Sometimes he gets bored even before me and wanders off. After many years of marriage, I have decided that covert is just not in my nature. Plus my husband just isn't a mind reader, as much as I thought I could train him to be. So I keep a running list on the fridge with things I want done. As long as he knows what needs to be done, he is more than happy to do it. Always start something and then hop in the shower then sing out "hey baby, can you just finish....... for me?" NB: doesn't have a 100% success rate, but what does these days? We often have an unacknowledged Mexican Standoff at our place – to see who can live with the mess the longest. I win hands down because I'm the instigator. But after reading your blog I realise that hubby has played me too. Even after 15 years, if I ask him to do the wash he still manages to slip a towel or two in with my black clothes. I just thought he was being thick. Whether it's pocket money, time on the XBox, or a day at the park, kids respond much better to chores if they're going to get something out of it. You have to remember that kids don't think like us supercleaning Mum's, so making a list of the things that their chores involve will help them immensely. They can check off each task as they go, instead of being nagged by Mum about all the things they overlooked. Don't set unrealistic expectations; you can't really expect a 5 year old to clean a whole room from floor to ceiling! Make it fun! Turn up the volume on their favourite songs, race them to get things done, or turn it into a game. Kids (and BIG kids) are more likely to cooperate if they don't notice they're doing something boring! So funny I am reading this today! While I was dustbusting the multitude of crumbs that accumulate around the house today, the little ones decided they wanted to join in the fun. Seeing as I have two dustbusters (they are used so frequently the battery runs out so often, I had to buy two! ), the boys were searching for and happily sucking up crumbs for at least an hour. It would have been perfect if they weren't so damn noisy! Moral of the story? Make it seem fun! Doesn't quite work for my husband though! I have 7 children, and hate cleaning, ( didn't realise how much mess they made once they turned into teenagers and didnt think cleaning was fun anymore. In our home it's easy, whichever child does the most jobs for the week, gets the next week off jobs. Whoever does the least jobs, helps clean the winners job for the week. Everyone trys to stay one job in front of the other. Now to stop the fights.. 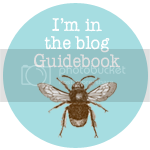 I'm following via GFC as Jasmine1485 and I'm a fan of Chux on Facebook (Kate Ryan) :) My method isn't very covert I'm afraid, I'm allergic to dustmites so I can't vacuum or empty the vacuum cleaner afterward. When I want my partner to put away the dishes (finally) though, I do ask him to get me a particular dish. When he finds it isn't in the cupboard he finally notices the pile of clean dishes to be put away. i have four kids and work full time. cleaning gets done here, there and in any spare moments that any of my family have. kids have learnt that they need to do little things whenever they can.. or mum does not take them places or give them money for things! I manage to get my kids to help clean by making it seem like something they DON''T want to do! My best tip for covertly encouraging my husband and kids to help clean is to tell them how wonderful they are at it and they are so much better than me! Also with my kids they love being "big helpers", works every time if I ask them to be my big helper. I just make it into a race. Monkey and Bear both HATE to lose to each other, so in their desperate efforts to one up they get the job done. My children are too wise to covert cleaning hints. Instead I am open about what we need to do and we all work together as a team. I'm an ace dealer - I offer them deal like if you help me by doing such and such, then you can have ten minutes extra watching Biggest Loser/on your ipod/computer - constantly dangling the carrot!! Well I get my 9yo to do some cleaning with me, and then he tells Hubby that as "You didn't help Mum, I helped her so I get to choose what we do on the weekend!!". I offer food and financial rewards - there is a list of what things are worth and then you can use that money in the mummy shop where I stock treats like M&M's, lolly pops, icecreams ect. So far its helping. I let the kids have heaps of fun with whatever we are going to clean up with eg chux in buckets and mops etc then we have a competition to see who can clean the mess the fastest. My daughter is, like all young girls, (and older girls like me) afraid of spiders. She found one in her very messy room and I told her that of course she found a spider, her room was messy. Doesn't she know that spiders love messy rooms b/c they can hide in all the junk. Particularly under the beds where things tend to end up. I swear I haven't had to ask her to clean her room in MONTHS! Even under the bed is tidy. I pray every day that she doesn't find a spider in the clean room, because the gig will be up! Ah... I have only two methods... and of course my teenagers eyes and ears pop up at the mention of pocket money.. but his version of clean to my version of clean, seem to be somewhat way different. I must be from another planet. Anyway, my last resorts to getting 'MY" way with help is to threaten to upload a photo of his room to Facebook! Immediately, the xbox controller gets put down and TV switched off, and he starts searching under his bed in an effort to quickly tidy his room to my satisfaction. Oh the panic and alarm on his face.... as I leave the room, I do the silent laugh... the only thing you see are my shoulders shaking from glee. I hate making the bed with a passion, have done ever since I was little. WhenI first moved in with my partner I tried to be good and make sure it was done every day. One day when he did make it, I made a big deal over it and told him that he did such a good job getting all the wrinkles out! He was so chuffed with himself he kept doing it and just became 'his' job! I really wanted to take you kids to the movies, but we can't fit in the car, what with all the mess. Have a clean freak friend the kids are scared of...shout "Kim's coming in 15 minutes" and watch the kids clean your house with enthusiasm and speed! If there's stuff all over the floor of the kids' bedroom, tell them you have chosen a secret item and whoever picks it up will win a prize (could be anything from choosing dinner, an hour with Mum, a Freddo frog etc etc ) Watch them fly!! This works well in classrooms at the end of a Craft lesson too!! Clean floor in 2 minutes flat!! When hubby (who suffers from domestic blindness...) tries to make a move on me, I point out The mess about the place and tell him if he wants to get down and dirty then get cleaning cos' it really turns me on!!! PS. I am following you and Chux! My kids love the "magic" of the microfibre wipes as it cleans their blinds from dust, they just love to help work the magic! Our main house rule is that all family members should help in cleaning the house. We schedule who’s washing the dishes, appliances, cars and even each room. Since the kids are also involved in the house cleaning, I see to it that our cleaning supplies are free from harsh chemicals.